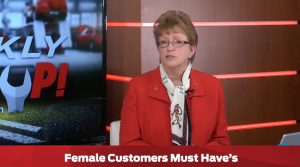 On this week’s episode of the Weekly Tune-Up, Becky Nixon talks about some “must-haves” for female customers and how to better serve female car buyers in your service drive. Hello, and welcome to this week’s episode of the Weekly Tune-Up Program here at CBTNews.com. This is where we get down to business about everything to do with the challenges and qualities of running a successful dealership Parts, Service or even collision department. I am Becky Nixon, the Director of Fixed Operations Training for David Lewis & Associates, and I now bring my decades of experience in retail automotive to this program to help you find solutions to any challenges you may be facing today in your dealership fixed operations. On today’s show, I want to deal with an important question that service faces every day when dealing with female customers, and that is: Your Female Customers Must Have’s. So, let’s get started. I recently went with a friend to a theatre production of “Men are from Mars ‒ Women from Venus”. It has been a very long time since I read the book and I was amazed how much I laughed and how much I learned. “Just as a man is fulfilled through working out the intricate details of solving a problem, a woman is fulfilled through talking about the details of her problem”. From this quote alone, you can already see where we get it wrong in our service drives. Most service advisors are male and most of our customers are female. You have a primarily solution driven male service advisor greeting a new process and detail oriented female customer with a warranty concern on her brand-new car. What can possibly go wrong? Research states that women speak about 20,000 words a day, that’s 13,000 more than the average male. Scientifically speaking, we have higher amounts of “language protein called FOXP2. It’s a substance found in the female brain that is responsible for vocalization. We train service advisors on the skill of active listening however we design our service write up process to be a series of closed ended questions. “Mrs. Smith is this your correct contact information? Is your mobile phone the best way to reach you today? The appointment states that your car hesitates first thing in the morning when driving to work, is this correct? These kinds of questions do not help you build good communication with your customers. A woman usually comes to a dealership service department already feeling vulnerable in the first place and fearful of being disadvantaged when it comes to understanding the maintenance or repair needs of her vehicle. What are the chances that she leaves your dealership feeling as if she wasn’t really heard? If she leaves after the initial write up and feels as if she wasn’t fully heard, and then the determination is made by your technician that he can’t duplicate the problem, it probably won’t be a satisfying experience for her and she will probably go elsewhere looking for a solution. Might she feel that, if you had been more patient, had listened to her explanation of the details and allowed her to vent instead of what felt to her as a hurried “Good morning, Yes, yes and yes and please sign here”, you would have found the solution to her vehicle concern and everyone would be happy? Your female customers want to be communicated with. You can no more expect her to be able to describe the problem she is experiencing on a technical level then she could expect you to go to a first-time knitting class and come away feeling like you understood the process and were ready to knit your first turtleneck sweater.
. . . . . Now a quick message, After that I will be right back to finish up this episode on what it takes to communicate successfully with your female customers in the service department.
. . . . . Welcome back to today’s show. Now, let’s keep moving forward on our conversation about what your female customers must have’s are and how it can benefit you to make sure they are getting what they need. According to Women Drivers.com, a higher percentage of women complete the manufacturers CSI survey and there are two consistent failures across all franchises that participate. Both of these failures are related to poor communication. The first one is this: We don’t ask open ended questions like, when exactly does the problem occur? We need to ask her for details without losing patience in the process. Secondly: Keep open body language, smile and don’t multi-task while she is speaking. Women are very sensitive to these kinds of things and can feel highly insulted if they sense you are not listening to them or if they pick up sarcasm or criticism in your body language or facial expressions. Your primary job is to advise your customers and help them solve the problem or need they are experiencing with their vehicle. You cannot do that successfully if you don’t give your best effort to listening to what they have to say and realize that it is part of the process that will help you excel in customer service and loyalty with your female customers. Women tend to take better care of their vehicles than men do and they depend upon their service providers to keep them informed of what needs their vehicles have in order to keep them in good condition and maintain them to high standards of safety and reliability. Learn how to successfully communicate with your female customers when it comes to protecting the quality and reliability of their vehicle investment and they will keep coming back to you when they need service or maintenance work done. . . . . . . . . . . Well, that is all the time we have for today. If you have any questions or comments, feel free to contact me at bnixon@davidlewis.com. And remember, if you want to advance your skills in this area and need guidance and training to do so, Visit our website at www.davidlewis.com or give us a call us at 1 800 374-3314. Now, have a great week and I look forward to being with you again next week on the CBT News Weekly Tune-Up Program.